The Mississippi eviction notice forms are the first step a landlord needs to take in the eviction process (called an “Ejectment”). The forms are required to ensure that the tenant has an opportunity to know of landlord’s intent and to either fix the problem, if it is fixable, or to move out. If the landlord fails to provide written notice as directed the court will not grant landlord an eviction. If the landlord satisfies the notice requirement and tenant fails to cure or move, the landlord then may file a Cover Sheet and Complaint for Non-Payment of Rent or a Complaint for Breach of Lease with the Local Justice Court. If the landlord prevails, the tenant is required to move out and the judge will issue a Writ of Possession. 3-Day Notice to Quit (Non-Payment) – This form is for legally informing the tenant that they have not paid rent and they have three days to do so before landlord begins eviction proceedings. If the tenant pays before the three days are up, the landlord may not proceed with the eviction. 14/30 Day Notice to Quit (Non-Compliance) – This form is used when a tenant breaches a lease term, other than for non-payment of rent. The tenant has thirty days to rectify the situation or move out unless it has been a problem for which the tenant has received notice about in the past, in which case, the tenant has fourteen days to move out and there is no opportunity to cure the breach. 30-Day Notice to Quit (Month to Month) – This notice is for letting a party know that the other party does not intend to renew a month-to-month tenancy. Rent in Mississippi is due on the day set forth in the lease. A tenant may cure the breach of non-payment up until the hearing by paying the full amount owed, plus landlord’s court expenses. Step 2 – If your tenant fails to respond, you may begin eviction proceedings (called unlawful entry and detainer) with the Local Justice Court. This entails filing a Cover Sheet, Complaint for Non-Payment of Rent or a Complaint for Breach of Lease. The court will issue a Summons and schedule a hearing and complete a warrant to be served on tenant between five and twenty days from when the complaint is filed. Step 3 – The tenant will have the right to respond to the Complaint and respond by using the Answer Form. Step 4 – If the landlord prevails in court and/or receives a judgment as a result of default, the court will issue a writ of possession no sooner than five days after judgment. Step 5 – If the tenant has not moved out, the landlord may take the writ of possession to the local sheriff’s office and have the sheriff handle the eviction. You will need to basic documents for most cases of delivering this Notice. The first will be the Lease held between the Lessor and Lessee. The second will be the Notice to Quit form for this state. You may obtain the latter by downloading it through the buttons by the image (PDF, ODT, and Word). The introduction line, located at the top of the page below the form title, requires the Name of the person who this Notice is aimed at to be reported. If this Name is found on the Lease, make sure it is reported precisely as it appears. The Notice will concern itself with a specific Property. Report the City, County, Zip Code, and Building Number of this Property in the first sentence. Each of these components will have a separate blank space where it should be entered. If there is an Apartment Number, report this as well. The Lease at the center of this Notice should have a Signature Date documented within it. You must report this Date using the blank spaces in the second sentence. Nonpayment Notice. 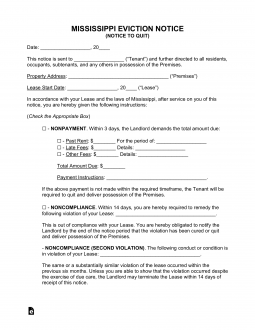 This is will warn the Tenant(s) or Subtenant(s) receiving this Notice that he or she will have Three Days to pay the Signature Party or an Authorized Representative an Overdue Rent Amount or be forced to yield possession of the Rented Property to the Landlord. This choice will require a definition to the Authorized Agent, the Amount Owed, the Minimum Amount that must be paid, and the Rental Period covered by this Amount to be entered on the blank spaces provided. Noncompliance (1st Offense). This Notice will warn a Tenant(s) or Subtenant(s) that he or she has violated the Lease and must successfully effect a solution within Thirty Days or yield the Rented Property to the Landlord. You must define this violation on the blank line provided. Noncompliance (2nd Offense). This Notice will inform a Tenant(s) or Subtenant(s) that he or she has violated the Lease in the same way two times in a row within a six-month period and will have Fourteen Days to yield possession of this Property to the Landlord. This violation should be defined on the blank line. Month To Month Tenancy – I am your Landlord. This Notice will inform the Tenant(s) or Subtenant(s) that he or she will need to yield possession of their Monthly Rental Property on the Date you enter in this sentence. Note: This date may not be within thirty days of the Tenant’s or Subtenant’s receipt of this Notice. Month To Month Tenancy – I am your Tenant. This Notice will inform the Landlord that he or she will need re-assume possession of the Monthly Rental Property on the Date you enter this sentence. This Date must be at least Thirty Days from the Landlord receipt of this document. The statement below the Notice section will require the Landlord/Agent Signature provided on the appropriately labeled blank line. The last section of this document, “Certificate of Service,” must be filled out by the Deliverer of this document at the time of Delivery. The Calendar Date, Month, and Year when this paperwork was delivered must be reported on the first three blank lines. Below this, on the blank line following the term …”served this notice…,” the Deliverer must enter the Full Name of the individual it was delivered to. The checkboxes below this sentence are meant to allow a definition for the method of delivery. By checking the appropriate box, the Deliverer will indicate if this document was delivered first hand to the Addressee, to a second party, or sent by First Class.